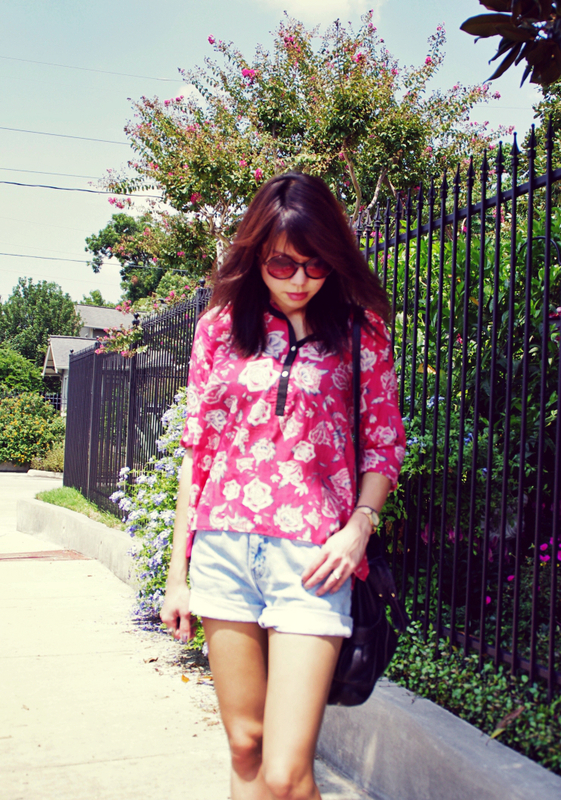 A pretty summery outfit for someone who's rarely caught in shorts and sandals. With this crazy heat though, you don't have much of a choice if you're running around the city. Here's my second Etoile floral shirt from IM's Spring 2012 collection. What can I say? She has a knack for spring florals. The western detailing on the back is my favorite part, adding a little unexpected edge to this girly top. The cutout sandals were a necessary purchase while I was away in Taiwan. Unfortunately, my favorite pair of sandals broke beyond repair during the trip, and I had to find a replacement stat. Frantically dragging the crew to Zara, I came out with this asymmetrical strappy pair, which I've been pretty happy about. Alas, that happiness was short-lived as one of the little leather bands holding in the strap broke on the second wear. With the band being too thick to sew, my only option has been the all-mighty super glue. Not sure how long it will last, but it's probably not a bad idea to keep super glue handy at all times for such emergencies. Really beautiful top..sorry about your sandals..that second one really came out of nowhere...and being new...that´s just a little stressfull lol.